Who Built the Colosseum in Rome? 04 Aug Who Built the Colosseum in Rome? Hey, do you know who built the colosseum in Rome? Hint: It was commissioned by Emperor Vespasian. But who actually built it? Hint: It was completed during the reign of Vespasian’s son Emperor Titus. About 200 yards from the Colosseum is Titus’ Arch. 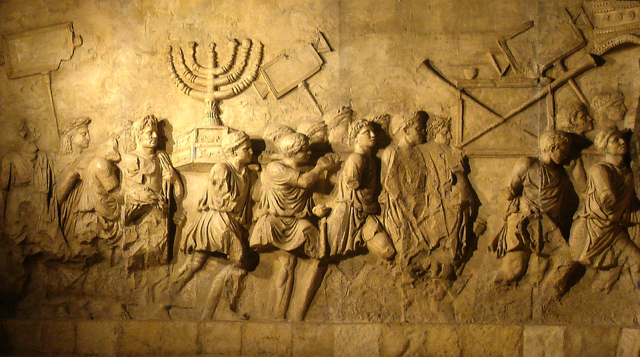 The arch commemorates the Roman victory over the Jews… Titus was the general who commanded the Roman forces when they destroyed Jerusalem and the temple in AD 70. Josephus was a Jewish leader who switched sides during the war with Rome. He wrote a history of that conflict in which he states that in the siege of Jerusalem, 1.1 million Jews were killed and 97,000 healthy, young survivors were sold into slavery. The blog’s photo shows a relief carving of Roman soldiers, wearing the garlands of victory, carrying off treasures taken from the temple in Jerusalem. The “spoils” included gold looted from the temple and almost a hundred thousand slaves. So now you know who built the Roman Coliseum… Jewish slaves! 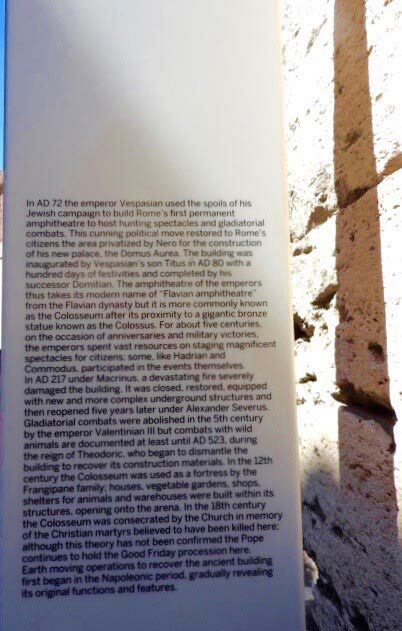 The big sign also says that the Colosseum was built on the site of Nero’s palace. There is a story here. In AD 64 a great fire had devastated Rome. Many believed that Nero set the fire so that he could annex prime land for his new palace. To deflect the blame for the fire, Nero accused Christians of setting the fire and he subsequently tried to kill all Christians. This sadistic killing spree was the tribulation that Jesus had said would happen before the destruction of the temple (Matt. 24:9). That tribulation ended abruptly 42 months later, in AD 68, when Nero was forced to commit suicide. When Vespasian came to power, he won favor with the people by destroying Nero’s palace and building the magnificent Colosseum on the site of the former palace. There is another story here, Vespasian was the Emperor of Rome when God established his everlasting kingdom as predicted in Daniel Chapter 7. 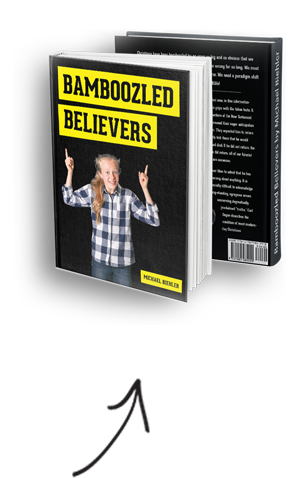 He was the “little horn” that Daniel described in his famous prophecy… but you’ll have to read Bamboozled Believers to get the rest of the story. You may be surprised to discover that there is no mention of the Antichrist in the Book of Daniel, and that the “little horn” is actually Vespasian.